This is a 2-day sale and the deal expires Saturday midnight (August 21, 2010). This looks like a pretty cool place to check out. Make sure you read the fine print below to make sure you’re ok with everything before you buy. Their restrictions seem a little more strict then most of the other deals. The world is rapidly evolving and so is our choice of dining altitudes. A recent study shows that more and more people are becoming jaded by the prospect of dinner at sea level. Maybe food tastes better when eaten at 400 feet in the air, you ask yourself. Maybe we should all be searching for a table in the clouds. Well, for just $14 we can answer all your high-dining questions with a 3-course meal at Cloud 9 Revolving Restaurant & Lounge. 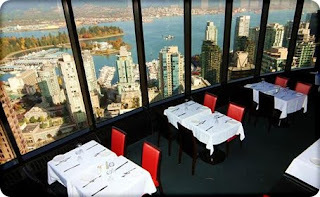 When you step off the elevator onto the 42nd floor into the Cloud 9 Revolving Restaurant & Lounge, you will be greeted with a spectacular view of Vancouver. The 20 feet high windows allow guests to be treated to an unobstructed 360 degree view of the majestic mountains, harbour, the Strait of Georgia, and the city itself. A kaleidoscope of vibrant lightings covers the walls and ceilings at every turn giving a lively look and feel even on the dullest rainy Vancouver day. Optic lighting from the ceiling gives the impression of stars in the sky, perfect for a romantic date or an intense cosmological debate.